Science assemblies and school workshops are a great way of stimulating your students’ desire to discover more about science and their world. 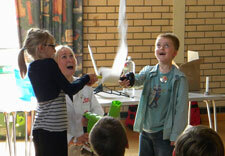 Who would have thought that science could be such fun? Our entertaining stories for assembly ideas and spectacular experiments often need young volunteers and press-ganged teachers! If you would like more information or to make a booking, please call us on 020 8953 5566 or complete our Schools Enquiry form and we will contact you within 48 hours.